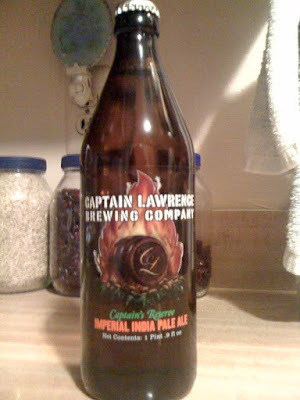 Captain Lawrence Imperial IPA, now in bottles! 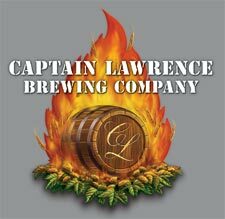 Captain Lawrence changed things up! They bottled their Captain's Reserve Imperial India Pale Ale in a much different bottle than their typical 750ml bottle with wrap-around label. What do you think of the bottle? I was a bit put off by it at first, as CL's bottles are always nice to look at with an eye-pleasing design, but I like this. It also allows for the very affordable cost of $5. 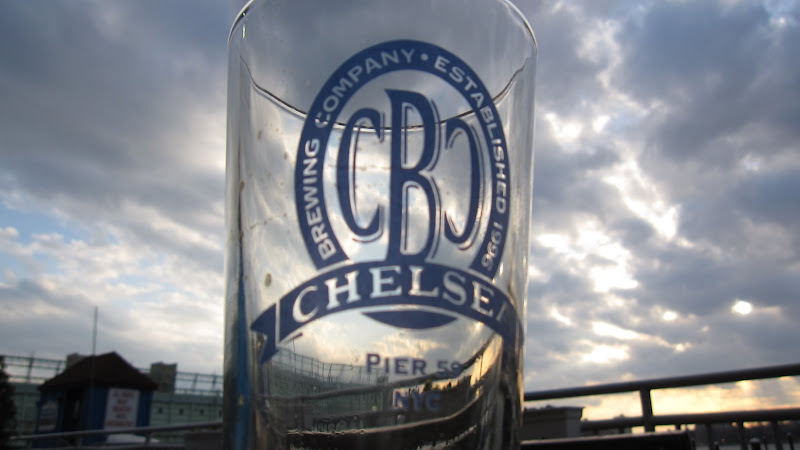 Are there really only 2 brewpubs in NYC? While thinking of a good place to found our brewpub (help us determine the name by voting in the poll to the right! 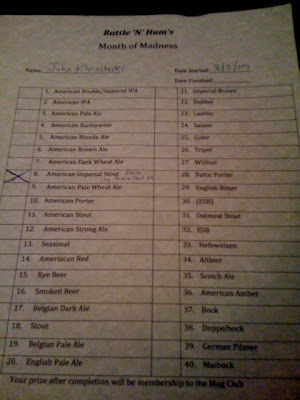 ), I began searching on BeerAdvocate for places in the area that are considered brewpubs. I was surprised to discover that the only ones listed are Chelsea Brewing Company (represented by the photo above) and Heartland Brewery. 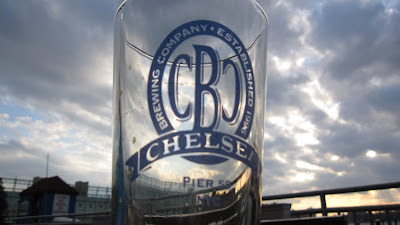 Chelsea is a good brewery/brewpub/restaurant that is able to boast that its the only beer actually brewed in Manhattan. Heartland Brewery is actually brewed in a facility in Brooklyn, but in general their multiple locations are tourist traps. I've never had a beer at any of them that really stood out to me. But what is curious is that I know that there are bars that tout their own brews on tap. So shouldn't they be considered brewpubs as well? Or are they trying to keep it relatively quiet? I'm assuming most of these types of bars can't actually brew on-premises, so where is it being done? Questions, questions! I'll have to do some investigating to find out. Speaking of investigating, this weekend I'll be traveling to one of two brewpubs in NJ (there aren't too many in Jersey either): The Ship Inn in Milford, NJ, which has some pretty good reviews on BeerAdvocate, or Trap Rock Brewery and Restaurant in Berkeley Heights. I am leaning toward The Ship Inn as Trap Rock has valet service, which is an immediate turn off. But Ship Inn is further, so we shall see. I'll document whichever adventure we go on and post the pictures here next week. I hate when this happens. 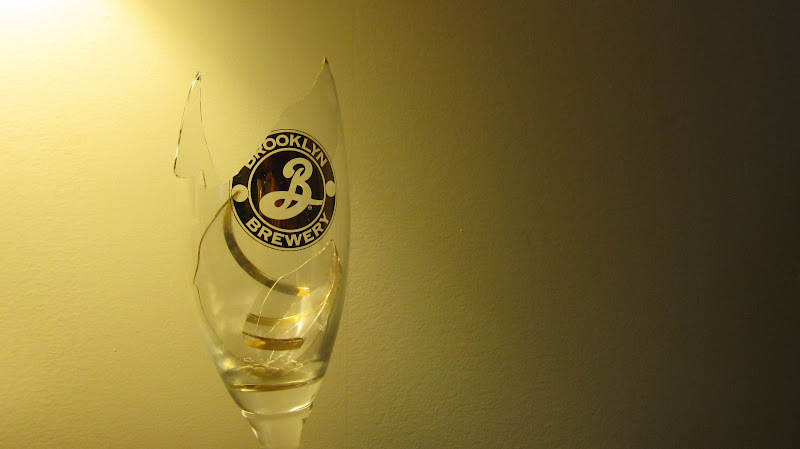 You get this excellent glassware (for free at the Brooklyn Local 1 release party a few years back) and well, it's just not that strong. It can't survive a short fall. Ah, well. These things happen. Oh, man. Russian River Supplication. Do want. This video is so mouth-watering, it's frustrating. Really, really wish I could get my hands on Russian River brews more often. Over to the right you will see a new poll for you to vote on. I've been thinking recently whether our homebrew moniker would translate to a commercial brewpub or not. I'd love to be able to hold onto the "brand" as it were, but there's a lot in a name, so maybe if we got to the commercial level, a name change would be necessary. What do you think? Almost 2 years ago, my brewing team and I attempted our first homebrewing adventure. Armed with nothing more than a starter kit from Homebrew Heaven and Charlie Papazian's The Complete Joy of Homebrewing, our brewing journey began. It's already funny to see how much more we've learned since then and I hope in a few years time, we watch this video again from our very own brewery. Not many of us are lucky enough to be born into the world of craft beer. Most of us start off with the cheapest stuff we can get our hands on. I think my first taste of beer was a Coors Light that my Dad let me try. That's basically most people's first experience. Then you get someone to buy beer for you while you're in high school which usually ends up being Bud Light or the like. Then it's off to college, where you're dirt poor and start reaching for the REAL bottom-of-the-barrel stuff. Milwaukee's Best (Beast), etc. What was YOUR beer of choice in college? Ours at Ithaca College happened to be Piels. You may never have even heard of it, but at $5.39 for a TWELVE pack, it was the best tasting and cheapest decision. 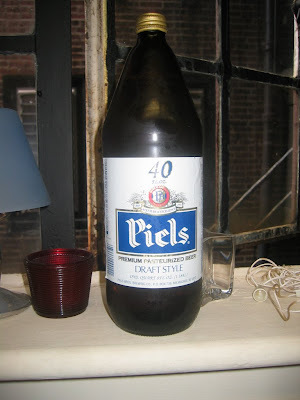 Only in recent years have I learned that they actually had a bit of an interesting history until they were sold off to Pabst, which is now owned by MillerCoors. So, what was your go-to brew before you were "in the know"? Cigar City Brewing is comprised of a 15 barrel (one barrel is 31 gallons) brewhouse occupying 6,600 sq. ft. of warehouse space in the Carver City-Lincoln Gardens neighborhood of Tampa. Six fermenters, also 15 bbl, are used to ferment the beer for packaging and kegging. We package using a 6 head PPM filler which allows us to adjust to many bottle formats and we keg in 50 liter and 5 gallon kegs. We use the highest quality ingredients we can lay our hands on and that is not just marketing jargon. If it makes better beer, we use it. We also strive to use local ingredients when and where we can. Not only do fresh local ingredients help us to make better beer, it helps us to make beer that reflects the culture and heritage of Tampa Bay. They also just got distribution to NYC as of Wednesday evening. 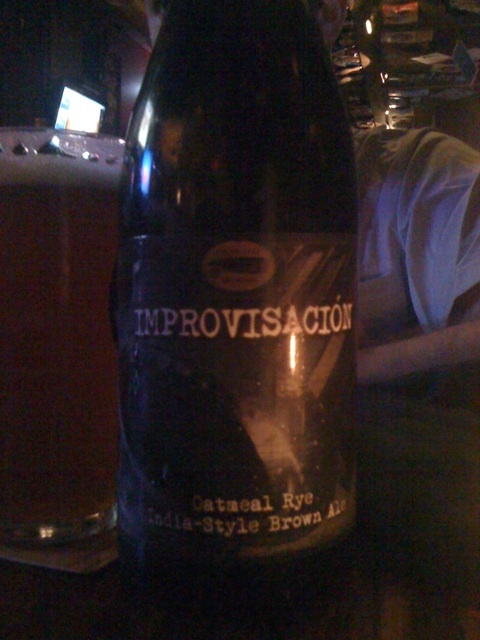 I was able to try the Jai Alai IPA and the Improvicasion Oatmeal Rye India-style Brown Ale (that's a mouthful! oh man, pun). Both were excellent, with the Jai Alai standing out as one of the freshest, hoppiest IPAs I've had on tap for awhile. Cigar City, I am now a fan of yours. It took me a little while to finally get around to Part 2 of this, as Part 1 was alllll the way back on August 10th. But I had to get around to do a little editing of video, the results of which are at the bottom of this post. 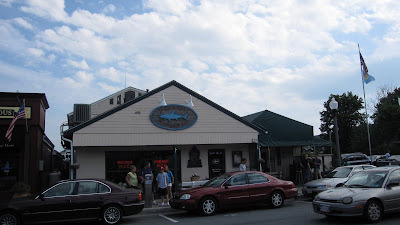 The Dogfish Head Brewings & Eats in Rehoboth Beach, DE is a great place to stop on a summer day or evening. Great beers, good food and friendly service. Plus there's an outdoor seating area so you can still be in that wonderful Delaware ocean breeze. 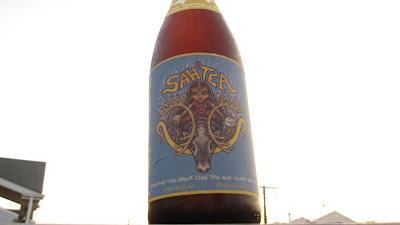 One of our main goals in our trip to Delaware was to acquire bottles of the above, the Dogfish Head Sah'Tea. The last time we went to the brewpub, this was a brand new, Rehoboth-exclusive brew, and it was delicious, as evidenced by Jeff's October 2008 review here. But since then, it had become popular enough to bottle! NYC's State Liquor Authority has yet to approve it's label for some reason, so it's not yet available for us to purchase. And of course, no trip to the land of the Dogfish is complete without it's crowning achievement, 90 Minute IPA. 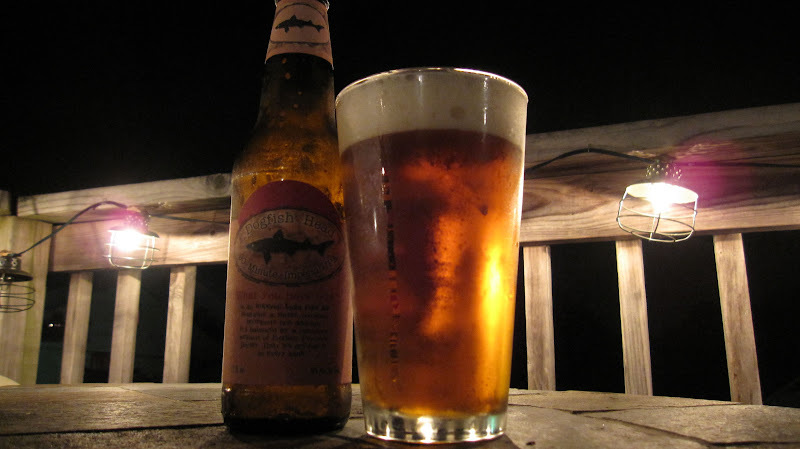 We used to frequently wonder how crazy it would be to attempt to CHUG Dogfish's biggest IPA, the 120 Minute. At 18% ABV (BeerAdvocate lists it as 21% but the DFH website says 18%) it seemed like it would be quite an intense experience. So we figured, since we were in the home state of Dogfish and could get bottles of 120 Minute for cheaper than we can here in NYC, why not give it a shot? (Plus, we were going to see WEEN and it was a much easier way of pre-gaming) Neither of us are good at chugging, and doing so is usually looked down upon by us and the rest of the craft beer community, but...we just...had to..
Is there a better smell than this? Well, yes. But this is still pretty smelltastic. This article on The Huffington Post today got my attention. It's great that a major news website like Huffington is promoting homebrewing, but they got a few things wrong here. As you can tell from the comments section, a lot of people realized the same thing. Pictures like this remind me that I need to start serving beers in the appropriate glassware. I guess a big wine glass like this isn't necessarily bad though. This beer is nice for a hot summer day (obviously) but it's nothing all that special. And BA users seem to agree. But down by Atlantic City where my parents live, the selection is pretty poor. Finding something like Anchor is almost a eureka moment. Please join us as a cask of NY3, the official beer of NY Craft Beer Week 2009, is tapped at 6pm at all three bars to officially open the Week. Servings of this beer will be limited to Passport holders only, who will each be presented with a complimentary 8 oz pour. Servings are first come, first serve and available as long as the firkin lasts. Figures that I'll be out of town for this, but here's to hoping I can still somehow get some upon my return. This is one of those beers that's virtually everywhere in Manhattan and Brooklyn, with the brewery being a mere LIRR train-ride away. But because of its frequency at my local supermarkets, I tend to overlook it. 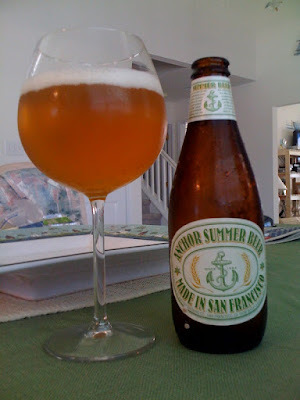 But some recent discussion on a message board that I frequent stuck in my brain upon a trip to the liquor store before heading down to the beach for the weekend, and I picked up a 6 pack. The BeerAdvocate average is a B+, and I would have to agree. This one leans more on the malty side, whereas I generally prefer a lighter, citrusy hopped kind of IPA. The major bitterness seems to come thru the nose as the malt takes over the taste upon first sip. Still, not bad at all to have within a short walk of work or home. And it could never be enough. As I noted a few weeks ago, a certain bar in NYC was able to hook me up with an entire growler (that's 64oz) of Russian River's Pliny the Elder. The very same beer that Zymurgy Magazine and the American Homebrewer's Assocation recently voted the #1 beer in the world. I think this could honestly be my desert island beer. I had previously traded one of my precious few Founder's Kentucky Breakfast Stouts for a single 500ml bottle of this, so this was a nice treat as I figured it'd be years before I'd get my hands on Pliny again. A beer truly deserving of all accolades. This is not beer-related (although I did blog about Icelandic Craft Beer not that long ago), but I've been distracted for the last week or so Iby editing this short video of footage we shot in Iceland a few months ago. I recommend going to youtube and watching in full HD instead of tiny as it is below! A heaping plate of bacon washed down with a frosty mug of beer is the perfect start to any day, but why can't scientists unite those two divine tastes into a single swallow? True, there is a German beer called Rauchbier, which means "smoked beer" and reportedly tastes like bacon, but it's not literally made with cured pig flesh. But at long last, Brooklyn Brewery brewmaster Garrett Oliver has heard the call of drunken gluttons and is developing a beer made with a special malt smoked in the same room with bacon made by "the legendary" Allan Benton. Oliver tells the Times, "It’s almost terrifying how much the malt smells like bacon." 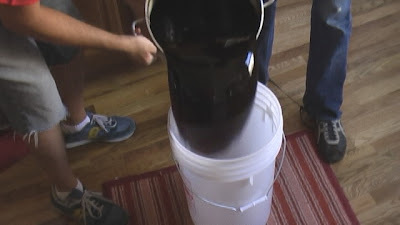 His ingenious plan involves infusing a brown ale with the flavor of Benton’s bacon fat through a technique known as "fat washing." The bacon-fat-infused ale is aged in bourbon barrels, and one historic day (t.b.d.) he will blend it with the bacon-smoked malt. And Oliver promises this to a world hushed with anticipation: "Either this will be the most amazingly disgusting thing you’ve ever tasted in your life. Or I shall rule the earth." Based on Mr. Oliver's track record, I'm going to guess he'll be ruling the earth in no time. Patrick Rue describes The Bruery Papier as a “big Old Ale with a Belgian touch.” This version of the beer is a bit different than the ones released earlier this month for the anniversary party. 25% has been aged in bourbon barrels for over a year; this was blended with a more recent batch that was aged with heavy toast oak cubes making up the other 75%. The other versions have been aged 100% in either Bourbon, Rye Whiskey, or Brandy barrels for over a year. I would highly recommend splitting this one with one or two of your craft beer drinking friends. Or even beyond that, throw it (gently place it) in your cellar and try it in a couple years. The bottle itself states that it'll age well for DECADES. Let me know how that goes. Sour ales and bourbon barrel-aged beers have been my two favorite styles as of late. That's why when I learned about Brooklyn Wild 1, I nearly fainted. There doesn't seem to be much info about this beer on the internet, and all I've been able to gather is from BeerAdvocate, where users were saying that they took Brooklyn Local 1 and aged it in bourbon barrels with brettanomyces (sour yeast strain). The other tidbit that was bouncing around was that this was somehow only available outside of the US (possibly in Belgium?) which is odd considering it's the Brooklyn Brewery. I was lucky enough to try this the night after the Brett Fest at Spuyten Duyvil in Williamsburg. I don't know much about the story behind this brew, but I would love to know more. All I had heard is that it is Local 1, bottle aged with Brett, and not available in the US. The nose is strikingly different to that of Local 1, pretty much a whole new beer in comparison. The bourbon is immediately present, but not overwhelming. You can practically smell the barrel...sour bourbon heaven. The backbone of Local 1 comes through upon your first sip in the mouthfeel, but quickly makes way for the sour notes of the brett and woody bourbon. 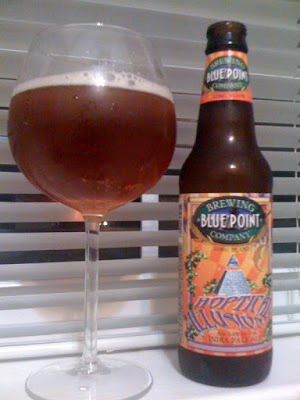 High drinkability as none of the flavors overwhelm your palete. Full disclosure: My two favorite styles right now are sour ales and bourbon-barrel aged stouts, so this was basically the ultimate beer for me. As the other reviewer mentioned, Garrett Oliver needs to make this available in the states, as I'd be purchasing it regularly. This absolutely needs to be made readily available in the US. It's excellent. Here at Rattle ‘N’ Hum we clean our beer lines after every keg has been kicked, today we just started using a new product to insure the cleanliness of our lines continues thus giving you the freshest, tastiest beer imaginable, the way the brewer’s intended. We are using a product from Austria that has been in testing with AB for 3 years. It’s a verification agent with line cleaning solution in powder form. We can monitor the cleaning process and inline verification with a color indicator. Chlorine free with active oxygen. It is compliant with DIN 6650 and HACCP norms. We think that our customers have every right in knowing what happens behind the scenes of RNH as you are trusting us with your health and hope of great clean beer!! So now you have it, peace of mind! Interesting. That's an aspect of beer and bar ownership I've never even thought to consider. They're changing their lines so frequently, this just plain makes sense. Tonight I'm off to RNH to add a few more beers to my Mug Club list. I have 24 more days to go and 35 more beers. It's gonna be close! Then its down to Spuyten Duyvil in Williamsburg to see what they have left from their Brett Fest on Sunday. 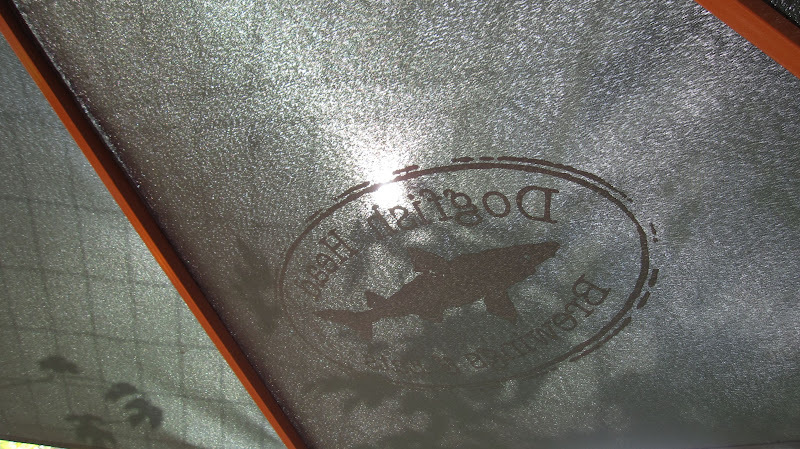 You can check out Rattle'n'Hum's full blog here. A few weeks ago, I was able to visit the Dogfish Head Brewpub in Rehoboth Beach, DE for the third time. Every time I go there, it inspires me more to open my own brewpub. 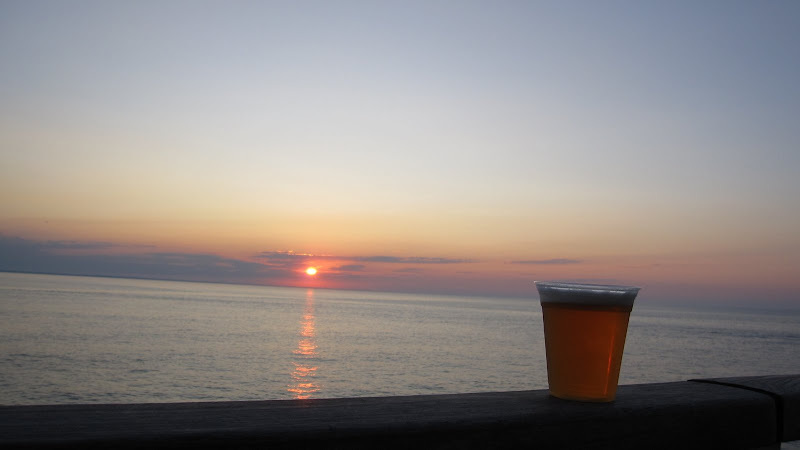 Excellent beers, great food and a beach right down the street. You really can't go wrong with that equation. Another great thing about the trip to Delaware is the Cape May-Lewes Ferry. 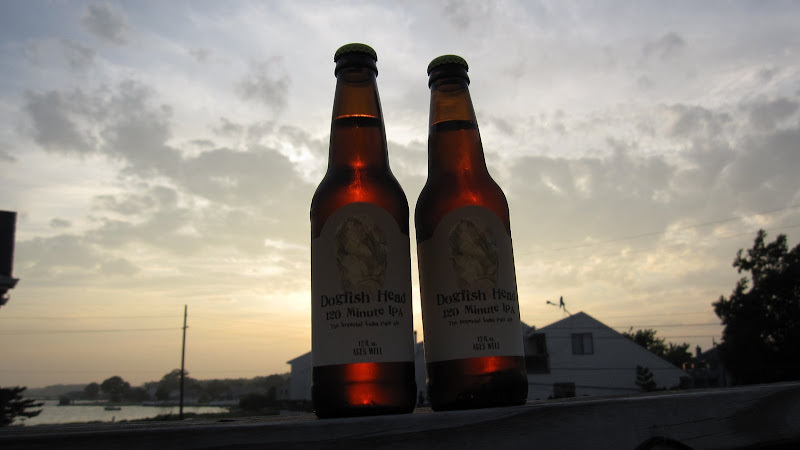 A nice 80 minute trip across Delaware Bay that serves Dogfish Head 60 Minute on board? Yes please. This image above is a teaser for Part 2. Let's just say that those beers were consumed...very quickly. Stop by Whole Foods Market Bowery Beer Room when Manhattan’s only brewery stops by to sample a selection of their craft beers. Once you’ve tasted each of Chelsea’s greatest, saddle up to the growler station to fill your 64oz or 32oz growler with one of their craft brews to take home. Traveling only as far as Pier 59, you can only imagine how fresh their beer truly is. Discover how the rise and fall and rise again of the beer brewing industry tells a larger story about the neighborhood of Williamsburg, the borough of Brooklyn, and even the country as a whole. On this walking tour, we’ll begin at the Brooklyn Brewery with a private tour and then we’ll head over to East Williamsburg to check out some of the last remaining 19th century brewery buildings; explore the diverse cultures and mom and pop businesses that make the neighborhood what it is today; learn about what happened to local beer producers; and discover how beer brewing has returned to Brooklyn. Along the way, we’ll also visit a couple of restaurants and merchants, hear the stories of residents past and present, and, of course, sample some of the finest beer Brooklyn has to offer today. A private tour of the Brooklyn Brewery, plus a taste of various selected beers on tap. A look at two remaining 19th century brewery buildings that were once part of the old Brewers Row. More Brooklyn beer and a slice of pizza because what’s beer without a slice?. Stories of brewing, bottling, and even bootlegging. A beautiful cathedral that was built by the German immigrants in the neighborhood. A visit to ABC Beverage Distributors to learn about how beer gets to customers today versus in the past. Tastings of traditional German beer and Brooklyn beer with gourmet small plates at Huckleberry Bar. Voted North Fork Event of the Year in 2007, the North Fork Craft Beer, BBQ & Wine Festival returns to the picturesque Martha Clara Vineyard on August 8, 2009. Martha Clara Vineyard is located at 6025 Sound Ave. Riverhead, NY 11901. Attendees are asked to follow the event signs and enter through the Herricks Lane entrance only. The event will showcase the finest craft breweries – 50 in all – from across the country and will pair them with outstanding BBQ prepared by Maple Tree BBQ and award-winning wines from Martha Clara Vineyards and other local wineries. 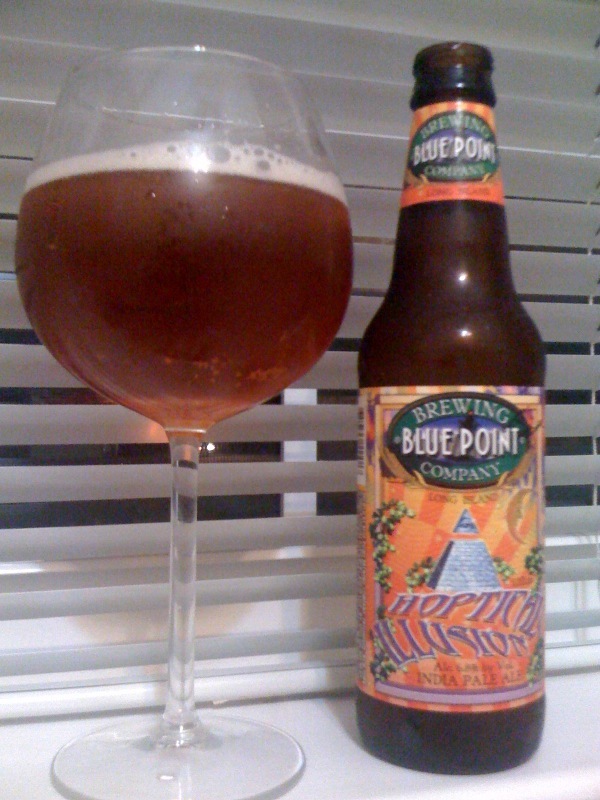 The event is sponsored by and will feature the award-winning beer from Blue Point Brewery and Southampton Ales & Lagers. In addition to local favorites, you’ll also have the opportunity to sample high-quality craft beer from national craft breweries such Boulder Beer Co., Brooklyn Brewery, Cape Ann Brewing Co., Dogfish Head, Harlem Brewing Co., Kona Brewing Co., Long Trail, Oscar Blues, Peak Organic, Sam Adams, Ramstein, Sly Fox, and many others. Attendees at the North Fork Craft Beer, BBQ & Wine Festival will have the opportunity to sample over 100 of the nation’s finest micro-brews. The event will take place rain or shine (no refunds). The fields will have multiple tents to house the attendees, breweries, wineries, special vendors, cooking demos, and event programming. Weather permitting; the middle of the field will have tables and chairs for your comfort and enjoyment. Beers available on tap for growler fills. 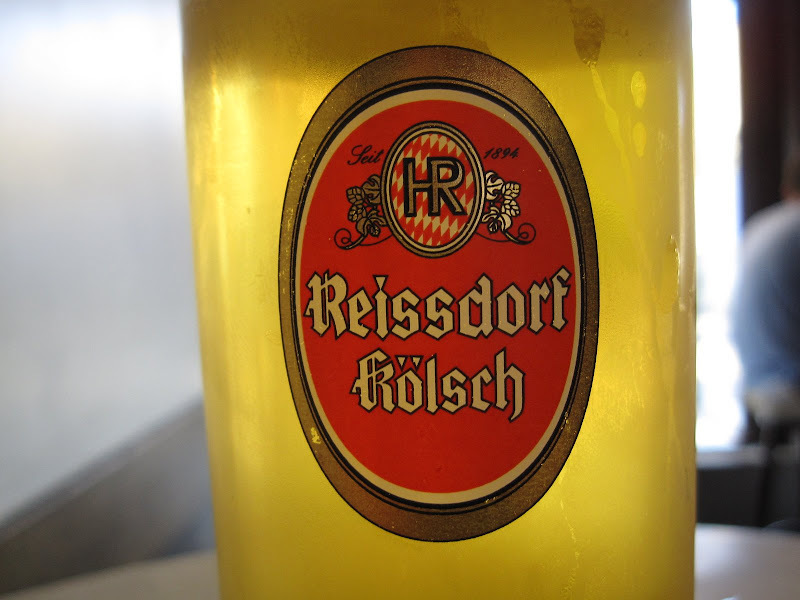 Is there a better Kölsch? Reissdorf Kölsch. If there's a better Kölsch, I'd like to try it, because this one is very very good. This was had at Loreley beer garden on the Lower East Side. We had a very busy spring this year, so Brett. Fest had to be pushed back to the dog days of summer. Sunday, August 9th at noon we begin our yearly ode to the funk. Come celebrate the small things, yeast and bacteria. This is just an insane lineup. I've never had any of these on tap outside of the Ithaca Brute, which is outstanding. And a few are incredibly rare Belgian offerings to have on tap in the US. Or as they also call it, the "Month of Madness". Well, this should be interesting. In order to become a member of Rattle'n'Hum's Mug Club, one must have 40 different styles of beer over the course of ONE month. So that means that that sheet shown in the photograph above must be full come 9/3. That seems to be a pretty tall order. The pros are that it's relatively close to work and it's delicious beer. The cons are that I have to keep going back and spending tons of money that I shouldn't be spending. But what's the benefit of the Mug Club that would entice one to take such a sudsy adventure? Well, first of all, you get your own MUG! And you get $1 off all beers for a year. So that's pretty decent. But my real motivation is that Patrick, the friendly owner of the bar, tends to get his hands on some pretty rare stuff. Stuff that's often not even available for distribution in NY. He recently let me purchase an entire growler of a certain Elder beer from California that I've only been able to trade or travel for. So, so good. Anyways, Patrick told me that whenever he gets something very hard to come by, he'll notify the Mug Club to assemble and partake in whatever brewing goodness he's found. I can drink 40 beers for that. I hope. Hopefully come September 3rd I can post a similar picture as above but with everything filled in. Wish me luck. I'll need it. How does one get a job in the craft beer industry? As I continue to immerse myself in the world of craft beer and homebrewing, I realize that my current job working in television is a dead end and not what I want to be doing with my life (not to mention extremely mundane). I have become passionate enough about the world of craft brewing that I realize my career should be aligned with my obsession. But the question remains, how does one get a job in the brewing industry? Does one go to brewing school at Siebel in Chicago or at UC Davis? Or does one try to find work as a bartender at a beer bar? It seems near impossible to find anything in the entry-level position at any breweries in the region, so more and more I'm thinking that the easiest way to get into the industry is starting your own brewery from scratch. Any by easy I mean very very difficult with tons of money that I don't have. Hopefully a few years from now I can look back at this blog post and laugh heartily while drinking our homebrew turned probrew straight out of a giant fermenter. 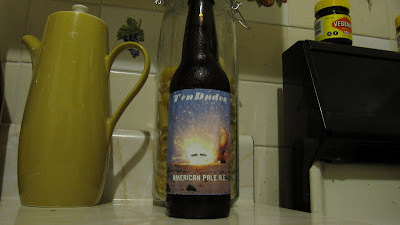 oh yeah, beertography...Here's one of our very first homebrews. We took an APA recipe kit and hopped it up quite a bit. When it was fresh it was outstanding. And now, 2 years later, although the hop flavors have mellowed a bit, it's still a very good drinkable beer.